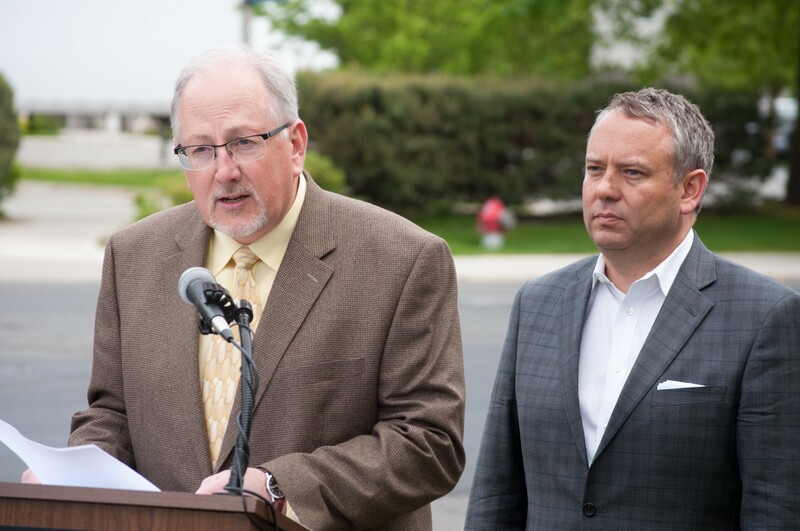 Spokane Streets Director Gary Kaesemeyer and Mayor David Condon are aware of the long road that lies before them. Mayor David Condon spoke from behind a lectern on a Sharp Avenue sidewalk, where the street itself illustrated the progress of Spokane’s roadwork projects. A grassy median with trees splits Sharp’s four lanes down the middle. The two lanes nearest Condon were smooth with a fresh layer of asphalt, while the two on the other side were riddled with potholes and crevices. On Thursday, Condon announced a new $1 million investment in street maintenance projects. He said the other side of Sharp would be repaired this year, but the roadwork was really intended to hold the avenue together until the city could redo it entirely in 2018. Condon said the especially long, cold and wet winter made it critical for the city to make repairs in preparation for more expansive street development. The projects will target main roads, called arterials, responsible for most of the city’s traffic, he said. The city was able to find $1 million for arterial maintenance after finishing other projects under budget and receiving grants that relieved financial pressure in other areas, said Marlene Feist, public works communications manager. This year’s roadwork is intended to maintain streets slated for total reconstruction next year. In all, 8.82 miles of new roadwork — in addition to 5.2 miles already planned — will take place over the next year, Feist said. Condon’s plan will also postpone 1.75 miles of “less critical” work on Thorpe Road, Palouse Highway and Altamont Street. “We are making choices and prioritizing the work that needs to get done,” Streets Director Gary Kaesemeyer said in a press release. The harsh winter caused an “extreme amount of damage,” especially on Northside arterials, Kaesemeyer told reporters. Moisture gets into cracks in pavement and expands when it freezes, which can make cracks bigger and cause damage to the base of the road. While street maintenance is normally done in warmer months, heavy snowfall forced the city to attempt repairs mid-winter. They used cold-mix asphalt to fill in potholes, but it often broke down or popped out. The city subsidized a local paving company, Inland Asphalt Co., to begin production of the more durable hot-mix asphalt earlier in the year. “We will focus on two things: maintaining our good streets so they don’t fall into state of disrepair, and holding together the damaged streets so our citizens can continue to use them,” he said. This is part of a strategy to “keep the good streets good,” Feist said. Currently, the city will focus on filling cracks and potholes and overlaying streets with pavement in preparation for more extensive roadwork next year, said Kaesemeyer, asserting that establishing a private partnership, getting to work early and repaving entire roadways will give the city “the best bang for the buck,” next year. In an attempt to make fewer temporary fixes, the city plans to pursue more major street replacements, exactly like the plan for Sharp. While grinding down a few inches of a road and paving it back over works for a little while, Feist told the Inlander in September, 6 inches of pavement on top of 9 inches of packed gravel at the base would make for a pothole-resistant street. Councilmember Mike Fagan showed support for the new investment and long-term plans. “We won’t solve all the concerns in one year,” he said. Dispatch from Sasquatch! : the great Charles Bradley is back!